In the world where everybody is hooked of being "mobile," there would always be an app for everything. And in the verge of competitiveness, companies seek for more customers by the use of smartphones and tablets. An app is very essential in the growth of the companies, nowadays, because they secure better user base experience and new clients. And of course, you don't need to be an expert to make an app. With Appy Pie app building platform, you can make your own app in three easy steps. Appy Pie markets their app building in "...as easy as a pie" tagline. But with the few steps and shiny aesthetics, their app building process is rather a piece of cake. They have only been in the business since January 2013 but their popularity blasted off in great heights. 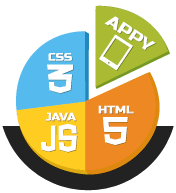 Technically speaking, Appy Pie offers service for the creation of HTML5 based "Hybrid" mobile applications using a cloud base program to do all the coding needs for its users. And when I say "Hybrid," I mean that the coded app could be published in any mobile platforms - Android, iOS, Blackberry and Windows Phone. There's no limit to what type of app you may create - games, ebook reader, utility app, business app, etc. Most of small businesses have pricing concerns with this tool. Basically, Appy Pie's app design is free. The pricing comes when you chooses the kind of plan the mostly differs in the way they publish your app. You choose from Free, Basic, Gold and Platinum Plans (check out pricing here). Aside from the breezy app making capabilities, Appy Pie also has its own Market Place where it lists all the apps that it has created. Their platform has been considered best in travel, business, entertainment and educational apps. If you need something to boost your business, or wanted to take it to a different heights, you should consider building an app through Appy Pie. It is one of the better solutions for quick and reliable HTML5-based apps. Build apps with Appy Pie here.